Ever wanted to hike a volcano? Parc National des Volcans is the perfect place to do it! The park covers the Virunga Mountain range which comprises six extinct and three active volcanoes. 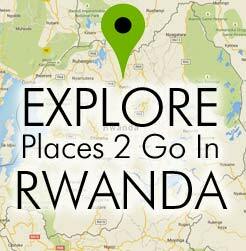 For the physically inclined there are hikes of varying lengths and endurance levels, offering picturesque views of beautiful mist-clad slopes of Rwanda mountain sides, and perhaps a chance to stumble on exotic wildlife. The easiest of all hikes is up Ngezi. This hike takes three to four hours from the parking at Bisoke. If lucky, hikers can see a variety of animals coming down the hills to get a drink from the streams. Bisoke (Visoke) mountain is the next in line for easiest volcano hike, though it is certainly no stroll in the woods. Depending on one’s pace and equipped with a requisite walking stick, it may take 4-5 hours of climbing to reach the top and about two hours to return down the steep slope. The hike brings you along all kinds of exotic plant life as the altitude changes and you pass through different ecological zones. Those brave enough to do it have said it’s entirely worth it with beautiful views into the volcano’s crater lake and DRC’s forests across the way. Insider Tip: The hike is in Gorilla and Golden Monkey territory. Since both species are unaware of who’s paid to see them, you could be one of the few lucky ones to have the unlikely second encounter with a Gorilla before or after your official trek! Climbing Karisimbi is for the serious outdoor enthusiasts prepared physically and mentally to take on Virunga’s highest summit. Karisimbi means “white shell” in Rwanda’s local Kinyaruanda language, named for the summits frequent snow-capped peak. It’s a two day trek that requires hikers to pack their own food, plenty of warm clothing, good waterproof hiking boots, a sturdy tent, and a very good sleeping bag. For $10, tents can be rented from the Rwandan Office for Tourism and National Parks on the day of the hike and hikers can opt to hire porters at the trail head to carry their packs packs for about $10USD/day. The first day brings hikers up between the Bisoke and Karisimbi peaks before ascending the northwestern side of Karisimbi to reach a metal shelter roughly five hours later at 3660m. Here, wind whips through and the heavy fog offers little chance for the sun to warm you up. Hikers pitch their tents and attempt a restful night to endure the remaining two to four hour trek through alpine vegetation the following day to finally reach the often snow-covered peak; the tallest in the Virunga Mountain Range and thus, the tallest volcano in Rwanda. Muhabura is the second highest summit in Rwanda just after Karisimbi, though it is argued to be the most difficult due to the steepness of the trail and the fact that it must be finished in one day, unlike Karisimbi. 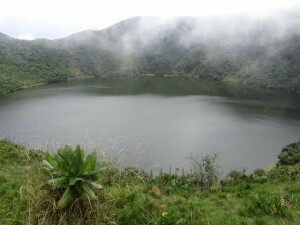 The trip to the summit of Muhabura takes about four hours and climbs about 5000feet. Those ambitious enough to endure are rewarded with a view spanning the other five volcanoes and the “twin lakes”. For the truly adventurous, a 2 day option is also available which dips over into Uganda to hike the Gahinga peak.